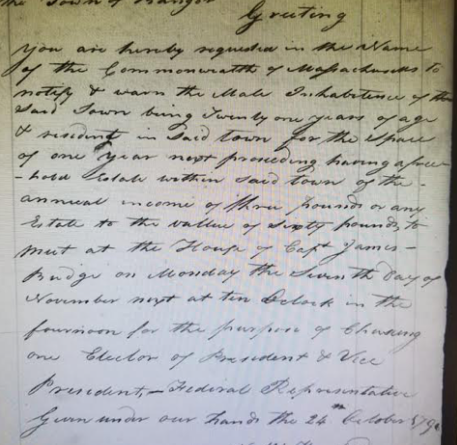 A screenshot of the 1796 document uncovered by Bangor City Clerk Lisa Goodwin. While digging through the archives at Bangor City Hall this week, Bangor City Clerk Lisa Goodwin unearthed a unique historical surprise. You are hereby requested in the name of the Commonwealth of Massachusetts to notify and warn the male inhabitants of the said town being twenty one years of age and residents in said town for the span of one year next proceeding having a freehold estate within said town of the annual income of three pounds or any estate to the value of sixty pounds to meet at the house of Capt. James Budge, on Monday the seventh day of November next at ten o’clock in the forenoon for the purpose of choosing our election of President and Vice President, Federal Representative. Given under our hands on the 24th October 1796. According to the document, one specific type of person was allowed to vote back then: free men over the age of 21 who own property, make above a certain income level and have lived in Bangor for at least a year. The warrant found this week was for the 1796 campaign between John Adams and Thomas Jefferson. Bangor went for Adams, who became the country’s second president. Bangor still uses a warrant for elections, which is just the official notice declaring that the city will hold elections, Goodwin said. Like other municipalities that date back to the 18th century, Bangor has records that are more than 200 years old — though unusually, Bangor has had exceedingly good luck in the preservation of those records, where other cities and towns have had them destroyed by fire, flood, mold or other means. In order to keep those records in good shape, Goodwin said that city has been slowly preserving and digitizing them all for several years now. Each page in each book is de-acidified, so the acid used in 18th and 19th century papermaking doesn’t eventually make the paper disintegrate. Each page is then scanned and then placed in a mylar sleeve to protect it from the elements. Goodwin said the goal is to eventually have all those old records available digitally, for anyone to search through and read.